The 'cached-consensus' file in Tor's data directory. For a great graphical overview see Jordan Wright's chart describing the anatomy of the consensus. # with an unset 'routers' attribute. Latest recommended version of a package that's available. Directory authority's commitment for generating the next shared random value. Digest of a consensus document. Common parent for network status documents. 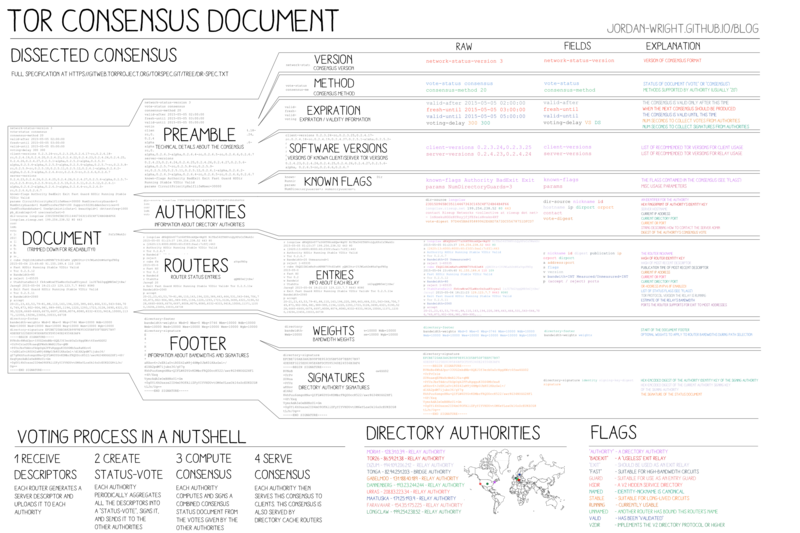 Version 2 network status document. These have been deprecated and are no longer generated by Tor. Version 3 network status document. This could be either a vote or consensus. Changed in version 1.4.0: Added the packages attribute. Changed in version 1.5.0: Added the is_shared_randomness_participate, shared_randomness_commitments, shared_randomness_previous_reveal_count, shared_randomness_previous_value, shared_randomness_current_reveal_count, and shared_randomness_current_value attributes. Changed in version 1.6.0: Added the recommended_client_protocols, recommended_relay_protocols, required_client_protocols, and required_relay_protocols attributes. Changed in version 1.6.0: The is_shared_randomness_participate and shared_randomness_commitments were misdocumented in the tor spec and as such never set. They're now an attribute of votes in the directory_authorities. Changed in version 1.7.0: The shared_randomness_current_reveal_count and shared_randomness_previous_reveal_count attributes were undocumented and not provided properly if retrieved before their shred_randomness_*_value counterpart. Changed in version 1.7.0: Added the bandwidth_file_headers attributbute. Changed in version 1.8.0: Added the bandwidth_file_digest attributbute. Checks if the current time is between this document's valid_after and valid_until timestamps. To be valid means the information within this document reflects the current network state. Checks if the current time is between this document's valid_after and fresh_until timestamps. To be fresh means this should be the latest consensus. Validates we're properly signed by the signing certificates. ValueError if an insufficient number of valid signatures are present. Checks if we meet the given consensus-method. This works for both votes and consensuses, checking our 'consensus-method' and 'consensus-methods' entries. Directory authority information obtained from a v3 network status document. The authority's nickname ends with '-legacy'. There's no contact or vote_digest attribute. Changed in version 1.4.0: Renamed our 'fingerprint' attribute to 'v3ident' (prior attribute exists for backward compatability, but is deprecated). Changed in version 1.6.0: Added the is_shared_randomness_participate, shared_randomness_commitments, shared_randomness_previous_reveal_count, shared_randomness_previous_value, shared_randomness_current_reveal_count, and shared_randomness_current_value attributes. Directory key certificate for a v3 network status document. Directory signature of a v3 network status document. Stand alone signature of the consensus. These are exchanged between directory authorities when determining the next hour's consensus. Detached signatures are defined in section 3.10 of the dir-spec, and only available to be downloaded for five minutes between minute 55 until the end of the hour. Network status document containing bridges. This is only available through the metrics site.